Varicella zoster Virus Reactivation in Otherwise Healthy Child. Varicella Zoster Virus (VZV) is a human viral infection. Reactivation of the latent VZV infection manifests as herpes zoster. Reactivation in children is rare as the age is the number one risk factor for reactivation. Complications of the infection include Post-Herpetic Neuralgia (PHN), a bacterial infection of the crusted skin, and neurological complications. We present a case of a 13-year-old child with herpes zoster infection accompanied by multiple risk factors. The patient presented to the emergency department complaining of a painful vesicular rash affecting the right side of his face. The rash appeared as multiple grouped vesicles on an erythematous base. After a thorough history, physical examination, and investigation; he was diagnosed with herpetic (varicella) vesiculobullous dermatitis. A subsequent pathology report confirmed the diagnosis. He was treated accordingly with a marked improvement by the second week. Reactivation of VZV infection in children is rare at a rate of (0.74/1000 person-years) among the 0 to 9-year-old age group and (1.38/1000 person-years) in 10 to 19-year-old age group. It is theorized to be a consequence of decreased cell-mediated immunity. Nonetheless, the reason of reactivation in immunocompetent children remains unclear. In the presented case, the patient may possibly have got exposed either in utero, through vaccination, or from major facial trauma. Varicella-Zoster Virus (VZV; Human herpes virus 3) is a human herpes virus infection that manifests in two clinically distinct forms: primary varicella and herpes zoster. As the primary varicella infection resolves, the virus passes through sensory neurological tracts of the affected area, eventually residing in the dorsal root ganglion of the infected dermatome in a latent form. Reactivation of the latent virus manifests as herpes zoster, which is commonly known as shingles . Clinically, herpes zoster is described as a multi-vesicular eruptive rash that follows a single or multiple adjacent dermatomes. It is often accompanied or preceded by acute pain and itchiness. Complications of the infection may arise, such as postherpetic neuralgia, bacterial infection of the crusted skin, and neurological complications . These complications can lead to impaired quality of life and even functional disabilities. Reactivation in children is rare, as increasing age is the primary risk factor in the general population . We present a case of a 13-year-old child, who was otherwise healthy, with herpes zoster with multiple risk factors, including intrauterine exposure to VZV infection. A 13-year-old boy, not known to have any medical illness, presented to the emergency department of King Abdulaziz Medical City in Jeddah, Saudi Arabia. The patient complained of a painful itchy vesicular rash affecting the right side of his face that was not preceded by systemic symptoms such as fever, chills or headache or associated with stress or infections. The pain was severe enough to prevent him from opening his mouth and eye. Three days prior to presentation, he had started to experience a burning pain described as toothache at the right upper angle of his mouth. One day after the pain started, he developed a vesicular rash affecting the right side of the oral mucosa and spreading progressively to the right side of the nose, reaching the right lower eyelid and causing redness of the sclera. On presentation, blood tests revealed an elevated level of C-reactive protein of 9.4 mg/L and a white blood cell count of 3.9 × 109/L. A swab culture from the face lesion was negative for herpes simplex virus (HSV) types 1 and 2. VZV-specific IgG was less than 10.0 g/L, with negative IgM. A skin punch biopsy was taken from a vesicle with a maximum diameter of 0.3 cm. The sections of skin showed intraepidermal vesicles with multinucleated cells and epidermal dyskeratosis with intranuclear smudged inclusions. The pathology report confirmed the diagnosis of herpetic (varicella) vesiculobullous dermatitis. A computed tomography scan of the head and neck showed normal brain parenchymal enhancement and right neck soft tissue swelling with no acute brain insult or lymph node involvement. The patient was a full-term baby of a healthy mother. Apart from varicella infection in the mother around 2 weeks prior to delivery, the pregnancy was uncomplicated. Upon delivery, the baby was admitted to the neonatal intensive care unit for observation because of suspected neonatal varicella infection. Three days later, he had not shown any signs or symptoms of infection, had not received any treatment, and were discharged in good health. The child received VZV vaccination at the age of 18 months and 6 years, as part of the Saudi Arabian national vaccination program. The mother did not report any previous varicella infection. At the age of 6 years, he sustained a major trauma to the face with lip laceration and bleeding that required suturing. On examination on the fifth day after admission, the patient was conscious, oriented, not dehydrated, and not in distress. 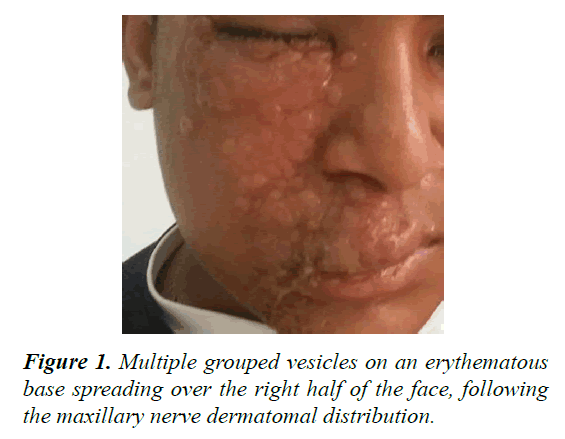 The rash appeared as multiple grouped vesicles on an erythematous base spreading over the right half of the face, following the maxillary nerve dermatomal distribution and sparing the forehead and chin (Figure 1). The patient’s mouth and right eye could not be examined as he was not able to open them due to pain. By the end of the first week after admission, ocular examination showed normal intraocular pressure and no redness of the sclera. The patient was admitted with raised clinical suspicion of herpes zoster. He was started on vancomycin and ceftriaxone. Acyclovir and clindamycin were added once the results of the skin biopsy were provided. He received vancomycin for 2 days, clindamycin for 6 days, acyclovir for 7 days, and ceftriaxone for 8 days. Figure 1: Multiple grouped vesicles on an erythematous base spreading over the right half of the face, following the maxillary nerve dermatomal distribution. By the end of the first week, the vesicular rash had converted to bullae, which then ruptured to form crusting lesions with yellowish discoloration (Figure 2). 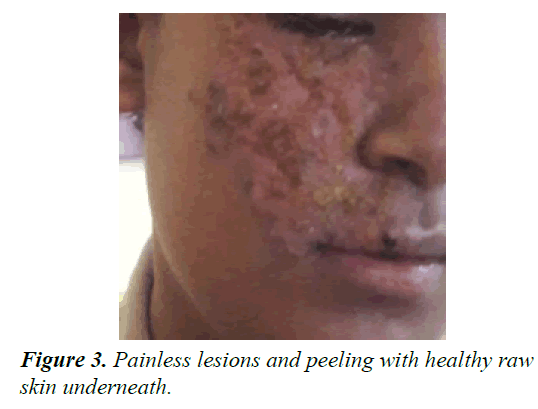 For topical treatment of the crusting lesions, the patient was started on potassium permanganate and white petrolatum ointment (Vaseline) twice daily. By the second week, the patient’s overall condition was markedly improved (Figure 3). The lesions were painless, crusted, and peeling, with raw skin underneath, and no limitations of eye or mouth movement were observed. He was discharged on 800 mg acyclovir five times per day for 7 days, in addition to topical potassium permanganate and fucidin cream twice daily for 1 week. Ten days later, the patient was seen for followup in the outpatient clinic. The facial lesion continued to improve, and a follow-up appointment was arranged for 2 weeks later. 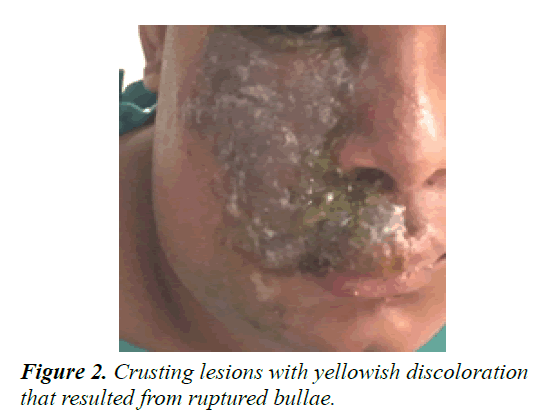 Figure 2: Crusting lesions with yellowish discoloration that resulted from ruptured bullae. Figure 3: Painless lesions and peeling with healthy raw skin underneath. Reactivation of VZV infection in immunocompetent children is rare with fewer than 10% of zoster patients are younger than 20 years, and only 5% are younger than 15 years . A field study conducted in the UK showed an incidence of 0.74 per 1000 person-years among children aged 0–9 years and 1.38 per 1000 person-years among those aged 10–19 years . It has been proposed that reactivation of latent VZV is a consequence of decreased cell-mediated immunity as seen in immunocompromised and elderly individuals [6,7]. The reason for reactivation in healthy immunocompetent children remains unclear. A number of studies have suggested that the risk factors for primary infection in children later presenting with herpes zoster include wild-type VZV infection, VZV vaccination, intrauterine exposure, penetrating trauma, emotional stress, and asthma [8-10]. In the current case, the patient may have been exposed to the primary infection in utero, through vaccination, or as a result of major facial trauma. However, the link to intrauterine exposure could not be confirmed due to the lack of proper documentation for the maternal varicella infection. Herpes zoster results from reactivation of a latent VZV infection and is rarely seen in healthy children; the reason for reactivation in this group remains unclear. A maternal VZV infection during pregnancy may play a role in the development of subsequent herpes zoster infection in the child. Moreover, herpes zoster can easily be confused with cellulitis or an insect bite, unless confirmed by laboratory and pathological investigations. Proper management is essential to prevent serious complications, such as neurological sequelae. Cohen JI. Herpes zoster. N Engl J Med. 2013; 369: 255-263. Gilden DH, Kleinschmidt-DeMasters BK, LaGuardia JJ, et al. Neurologic complications of the reactivation of varicella–zoster virus. N Engl J Med. 2000; 342: 635-645. Pinchinat S, Cebrián-Cuenca AM, Bricout H, et al. Similar herpes zoster incidence across Europe: results from a systematic literature review. BMC Infect Dis. 2013; 13: 170. Hope-Simpson RE. The nature of herpes zoster: A long-term study and a new hypothesis. Proc R Soc Med. 1965; 58: 9-20. Staikov I, Neykov N, Marinovic B, et al. Herpes zoster as a systemic disease. Clin Dermatol. 2014; 32: 424-429. O’Connor KM, Paauw DS. Herpes zoster. Med Clin North Am. 2013; 97: 503-522. Leung AK. Herpes zoster. In: Leung AK (ed.) Common problems in ambulatory pediatrics: Specific clinical problems. New York: Nova Science Publishers, NY, USA. 2011; 285-290. Kim BS, Mehra S, Yawn B, et al. Increased risk of Herpes zoster in children with asthma: A population based case control study. J Pediatr. 2013; 163: 816-821. Tseng HF, Schmid DS, Harpaz R, et al. Herpes zoster caused by vaccine-strain varicella zoster virus in an immunocompetent recipient of zoster vaccine. Clin Infect Dis. 2014; 58: 1125-1128.